The hamstrings are a muscle group located on the back of the upper leg and thigh. The semimembranosus and semitendinosus are two hamstring muscles located on the inside of the upper leg. The bicep femoris is a hamstring muscle located on the outer back side of the upper back leg. Collectively, these three muscles make up the hamstring muscles. When it comes to such sports as soccer, basketball and volleyball or those that require constant pivoting, hamstring need an attention. Women often spend more time doing bench presses and leg extensions, which strengthen the quadriceps, and pay little attention to working the hamstrings. Ideally, the hamstrings should lead the response in fitness training, tightening first. 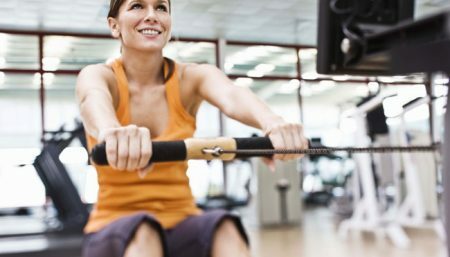 Women tend to work on their quadriceps more because they strengthen quickly. They think their legs are getting stronger, but they are really not. They need to do activities that increase the quickness of the hamstring response, in addition to exercises that build up the quadriceps. It’s simple -having stronger hamstrings will help you lift heavier weights on thesquat and leg press. Also the strength in the hamstrings helps to maintain a full stride even when you are tiring during brisk walking or running, supporting the idea that strength can help delay fatigue. Analysis of muscle activity during running action has shown that the hamstrings are most active during the second half of the stance phase. This means they are working when the leg is extending backwards at the hip, propelling the athlete forwards. Since hamstrings provide an accelerating force at each push-off, stronger hamstrings should result in a longer stride. Lie on your back with your feet hip width apart and the soles of your feet on an 18” bench or step. Push down into the bench with your feet lifting your hips up high. You will feel your hamstrings working. Hold this position for 30-60 seconds. Do not lift your shoulders or neck off the floor and keep your upper back flat down. Lower the hips back down until your bottom is just off the floor, then push down into the bench again. Continue for 15 repetitions, rest for 45 seconds, then complete two more sets. Working the HamstringOnce you can do 3 x 15, progress to one-legged hamstring hip lifts on the bench. Start with 3 x 10 and build up to 3 x 20. Once you can do the one-leg lifts on the bench, progress to using the Swiss ball. Place two feet on the Swiss ball, as you did on the bench, and complete the exercise using the same technique. The instability of the ball automatically makes it harder.